Improve your posture, strengthen your core and improve your movement for work, fitness, or athletic activities. Pilates classes at Physical Achievement are private class limited to 10 participants for individualized instructor attention and feedback. Class will run for 8 week time periods allowing maximum learning and advancing toward your health goals! Years ago, Joseph Pilates developed a type of exercise that has become one of the most popular forms of exercise today. Many are involved in or are interested in starting a Pilates exercise program. Indeed, one of the advantages of the Pilates method is that it works so well for a wide range of people. Athletes and dancers love it, as do seniors, women rebounding from pregnancy, and people who are at various stages of physical rehabilitation. While no exercise results in drastic improvements immediately, if you do it on a regular basis, you will definitely notice great changes in both your body and lifestyle. 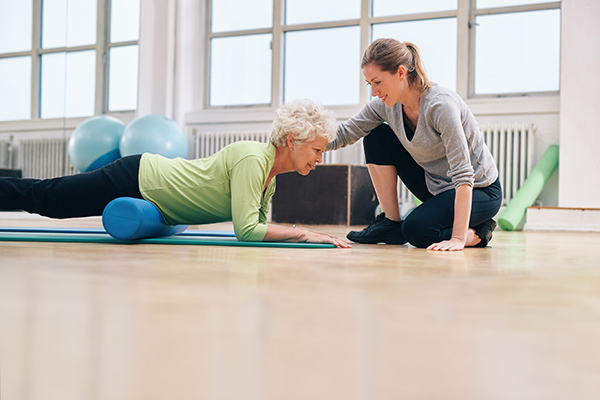 One of the unique features of Pilates is the ability of healthcare providers to modify the particular exercises for rehabilitation purposes. This adaptation of Pilates is the key to its success across various patient groups because the exercises can be tailored all rehabilitation and fitness. If you are suffering with muscle aches and joint pains, Pilates may be a treatment approach that matches your specific needs. We suggest you contact our office and ask one of our Pilates experts how this treatment approach can help you. Centering, control, flow, breathing, precision, and concentration and are integral to a quality workout. What sets Pilates apart from other workouts is that instead of emphasizing repetition of moves, it focuses on the quality of each move with an emphasis on accuracy and precision, which, in turn yields significant results in the shortest amount of time. By training the body as a whole, rather than isolating certain muscles, you will improve your movement, enhancing your life greatly. Overall, Pilates can present a number of health benefits for anyone at any age. Research on Pilates has concluded that this specific exercise approach can help with fall prevention. Fall is one of the leading causes of injury among elderly people. After a few weeks of Pilates exercises, many women demonstrated greater balance control, as well as, an increase in their range of motion and flexibility in the legs. The research subjects experienced improved confidence and better static and dynamic balance. Pilates strengthens the hip and leg joints, as well as the body’s core, which can greatly promote stability. This increase in stability leads to an improvement in balance, coordination and agility. An imbalance between your strength and flexibility, sometimes called crossed pelvic syndrome (when it occurs at the trunk and hips) can have a negative impact on sports performance. As you exercise, you will find that maintaining the proper form is extremely important and can help lengthen tight muscles and strengthen opposing weak muscle groups. Pilates exercises can result in increased support and stability of your back and stomach muscles. These muscle groups both move and stabilize the spine. It has been proposed that a stronger “core” improves the strength and coordination of your upper and lower extremities. Poor posture may be related to future injury. When you slouch while walking, or sitting you can pull a muscle, and lessen the spine’s ability to absorb shock that can lead to neck strain. While there’s little scientific evidence to support the concept, pain may stem from poor postural habits. Regular Pilates exercise helps increase your awareness of your body, a term described as enhanced proprioception. Regular awareness exercises, like those involved with Pilates, may help you better self-correct your posture. Improve your movement’s efficiency, as well as, your own awareness of your body, through Pilates. Pilates forces you to pay close attention to your own breathing, the way you position your muscles and limbs, and encourages strong concentration on form. All of this combined forces you to become more in tuned with your body, which, transfers over to serve you in everyday life. As you can see, a Pilates-based approach to rehabilitation and wellness is adaptable, progressive, and a comprehensive method for both patients with musculoskeletal pain and members in the community that desire to improve and maintain their wellbeing. We encourage you to call us today to learn more about our Pilates Treatment and Wellness Programs.